Imagine the government telling you how much meat or chicken you could buy, or how much sugar or flour you could have. Strange as it may seem, at one time it actually happened. During WW 2, the United States government devised a food rationing program to help insure that every family would have enough to eat. 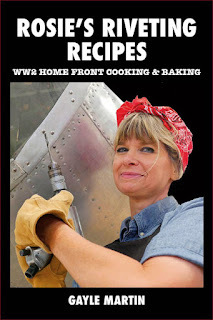 Rosie’s Riveting Recipes gives a glimpse into life on the WW 2 home front. A cookbook and a history lesson in one with more than 180 economical, back-to-basics World War 2 ration recipes with short tales of life on the American home front interspersed throughout. Rosie’s Riveting Recipes is available on Amazon, BarnesandNoble.com, BooksaMillion.com, and PowellsBooks.com. An eBook edition is also available for Amazon Kindle.